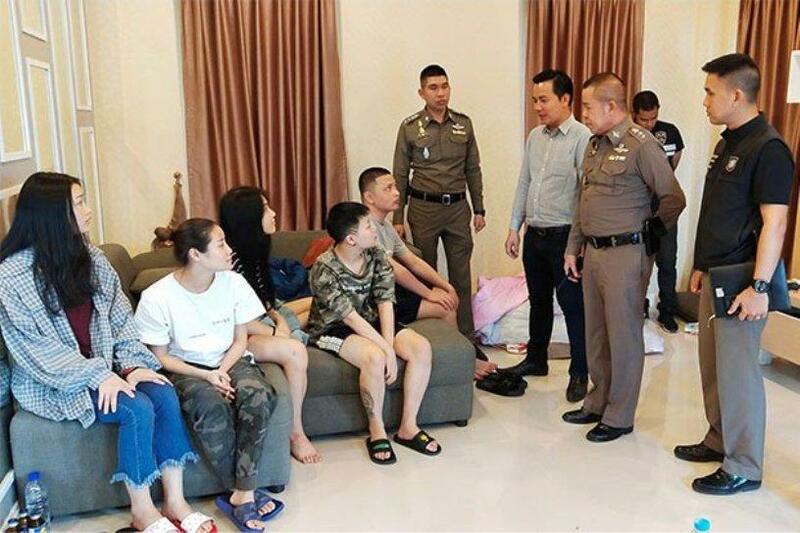 PATTAYA – A combined team of Chon Buri and Pattaya tourist police have arrested 12 members of a Chinese loan-sharking gang using Pattaya as a base for an illegal lending service in China charging clients 30% interest a month. Police armed with search warrants entered two rented houses at Garden Ville 2 housing estate in tambon Huay Yai around noon. The first house five Chinese nationals – a man and four women – were sitting working at computers, which were seized along with internet communication equipment and documents. At the second house, about 300 metres away, seven Chinese men were working on computers. Many sets of documents giving details of loans and customers were seized, along with computers, internet gear and other items. Pol Col Chiddecha Songhong, superintendent of Nong Prue police and head of the Chon Buri police centre to suppress transnational criminals and illegal immigrants, said they had received information over a month ago that Chinese nationals had rented two houses at the estate. They seldom went out and when they did their actions aroused suspicion. Investigators learned they were running a website illegally providing a money lending service, Pol Col Chiddecha said. The 12 suspects had been hired by a Chinese loan shark and paid 20,000 baht a month to operate the illegal service in Thailand. The gang paid 40,000 baht a month to rent the two houses, which they used as their base of operations. The five suspects in the first house were tasked with contacting customers and approving loan applications via the internet, at an interest rate of 30% a month. The seven in the second house were tasked with collecting money and interest from customers. They would send personal information about debtors who made late payments or refused to pay to gang members in China, who would collect the money. At least one million baht a month was circulating through their racket, Pol Col Chiddecha said. During interrogation, the 12 suspects told police they had entered Thailand as tourists. They chose to operate the money-lending service from Thailand because the penalties in China were severe. Police initially charged them with being foreign nationals on temporary stay visas working without permits. They were later handed over to Huay Yai police station for legal action. So what happens when a shark team is busted and neutralised, are debts forgiven or taken over by our glorious leaders? CHINESE are more than welcome to come here,free visa's and fast track entry.